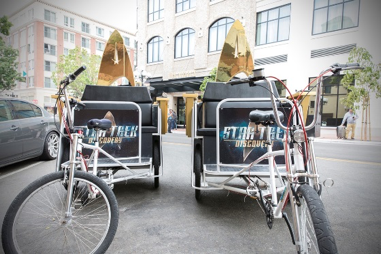 Beam me up to San Diego Comic Con 2018 with Star Trek Discovery from an exhibition to pediecabs to panels it’s going to be a Four Day Trekkie Party! We’ve all been counting down the days until we see Star Trek: Discovery S2 and so am very excited to learn that the panel is Friday, July 20th at 1:30PM, Hall H. It was announced that Sonequa Martin-Green, Doug Jones, Shazad Latif, Mary Wiseman, Anthony Rapp, Wilson Cruz, Mary Chieffo, Anson Mount with executive producers Alex Kurtzman and Heather Kadin will discuss the upcoming season. The panel will be moderated by series guest star Tig Notaro (Chief Engineer Reno) who I hope will say “I’m Giving’ her all she’s got, Captain” in homage to my favorite engineer Scotty! They will discuss season one (I’m still shook about the mirror universe), who’s coming back, our new Captain Pike, and how they will navigate the Star Trek Universe. Why walk when you can pedicab in style? Starting Thursday, July 19th to Sunday, July 22nd you can grab a free ride on the U.S.S. Discovery around the Gaslamp District. The U.S.S. Discovery Captain Chair pedicabs will have built in armrest video monitors screening trailers for the upcoming 2nd season, stitched black seats and illuminated Delta shield on the back. CBS All Access is CBS’ digital subscription video on-demand and live streaming service. In addition to its original series, which include STAR TREK: DISCOVERY, THE GOOD FIGHT, STRANGE ANGEL and NO ACTIVITY, CBS All Access gives CBS fans the ability to watch more than 10,000 episodes on demand – spanning current shows from primetime, daytime and late night, as well as past seasons of select series and classic TV hits – and stream their local CBS station live. CBS All Access is currently available online at CBS.com, on mobile devices via the CBS App for iOS, Android and Windows 10, and on Roku Players, Apple TV, Chromecast, Android TV, Xbox One, PlayStation 4, Fire TV, Samsung Smart TVs and Amazon Channels. For more details on CBS All Access, please visit: https://www.cbs.com/all-access/. Next ArticleWho’s Conan bringing to 2018 Comic Con?